Under construction website templates helps you to retain customers when you are busy in revamping your website. Even some of the websites manage to get as many leads as possible before launching their site using the under construction page. We have listed some of the best free under construction website templates in this list. In WordPress, there are plugins to help you create an under construction website pages easily. For the people who are using HTML website templates these free under construction website templates will help. There are certain things to note before making an under construction pages. If you are building a new site or revamping your site, make some basic SEO for the under construction page. To gain better ranking in the search result. In the meta description make use of your target keyword and power words to increase the click-through rate. Since Google has increased the snippet word count from 156 to 320 you have lots of space to describe in detail about the pages. The message you show in the under construction plays a vital role in retaining the visitors and to collect new leads. So tailor the message to your audience and make a strong first impression for the new users. There are other two web elements you must add in the under construction template. One is the signup form and the other is your social media profile links if you are very active in the social media. If only one section of your website is under construction and rest of the pages are working fine, then provide the alternate page links in the under construction template. This time to help you get the best modern free under construction templates, we along with our designers have made many attractive and user friendly premium quality templates for you. Each one of them is unique, so make sure you check all the 23 free under construction templates. If you are using a modern creative consultancy website template like the Cellon template we gave you. Then this under construction template will make a perfect addition. This template is clean and simple with the modern design trend. The intuitive full-width design of the template manages to cover the entire screen space. The trapezium style split screen design gives ample amount of space for the animated countdown timer and the text message. On the left hand side, you have the subscription form with casual tone message. To the bottom left corner, you have the option to add your social media profile icons. On the right hand side, you have two pairs of circular dials for the countdown timer. The animation effects on the timer are subtle and the timer is interactive to your mouse movement, small minute detailing makes the templates unique right? This template can be used in with a software company website templates and regular style business website templates. Instead of a static background, we have added image slideshow. 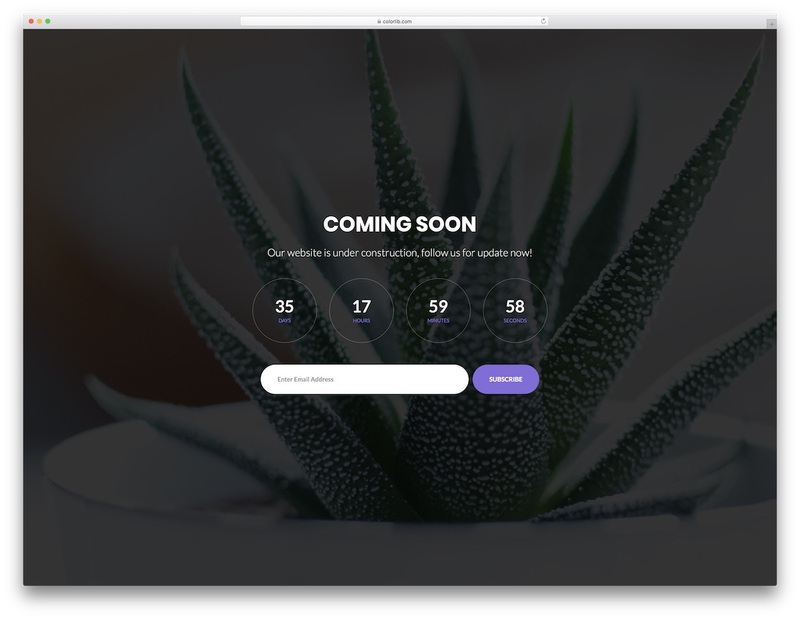 If you are using this template for a newly launching website; you can use this space to give a gist about your company to make the users curious about your site. If yours is a photography website template then you can use this feature to show some of your best clicks even when your site is down. Apart from the image slideshow feature you get useful web elements like animated countdown timer and a subscription form. If you are wondering how to change the image background with your images, it isn’t a problem. We have used the latest HTMl5 and CSS3 framework, with the neatly written code customizing the template won’t be a big issue for you. Our third version of the free under construction template is minimal looking and designed specifically for the minimal style website templates. This template also helps you to remain brand focused. We have given you space for adding your logo at the right spot where the user sees directly. The color scheme of the template is a violet color if you have a brand color you can change this color to your brand color. 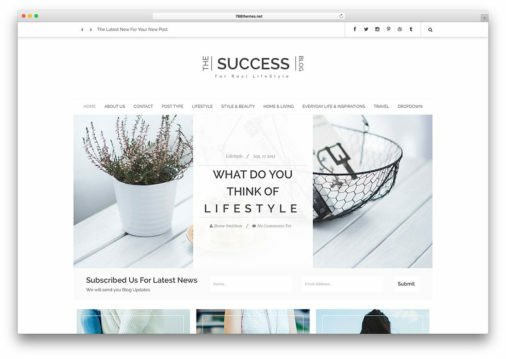 Even if you are a blogger switching your site from one server to other this template can help you to retain your readers. 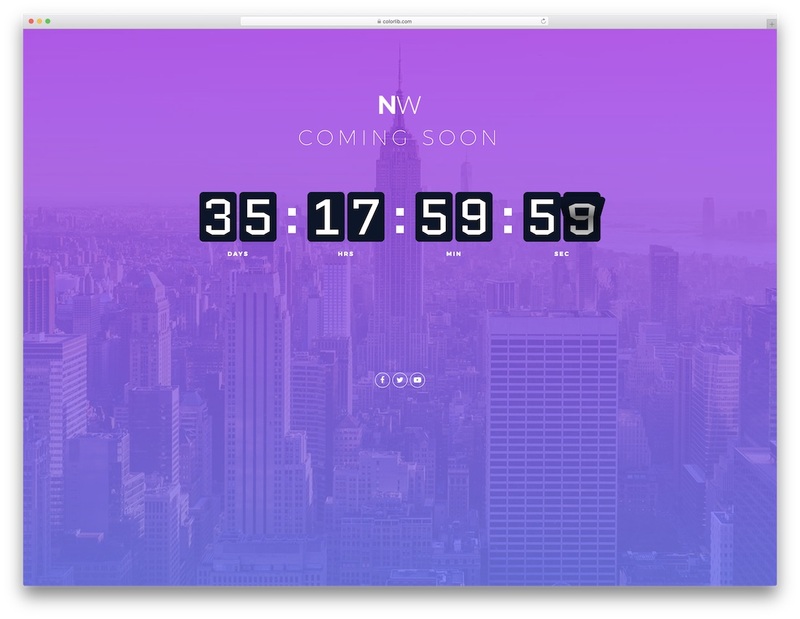 The rounded rectangle countdown timer dial looks elegant on this full-page template. The dark color of the timer manages to stand out from the clean white background. 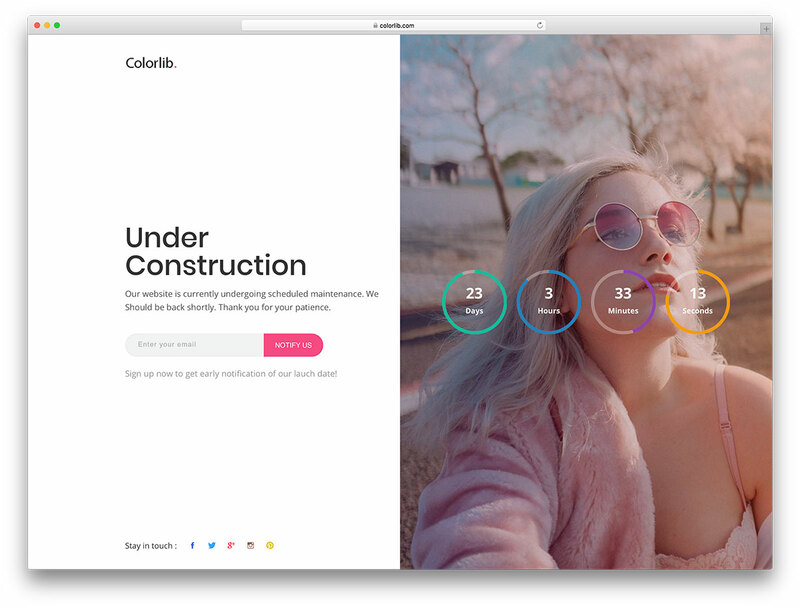 If you are searching for a colorful under construction template, then this template is for you. Instead of boring mono-color background, we have used trendy gradient color background. This template can be used if your site is going to be down for few hours. It is a generic template, so you can make use of this template in any type of website template. 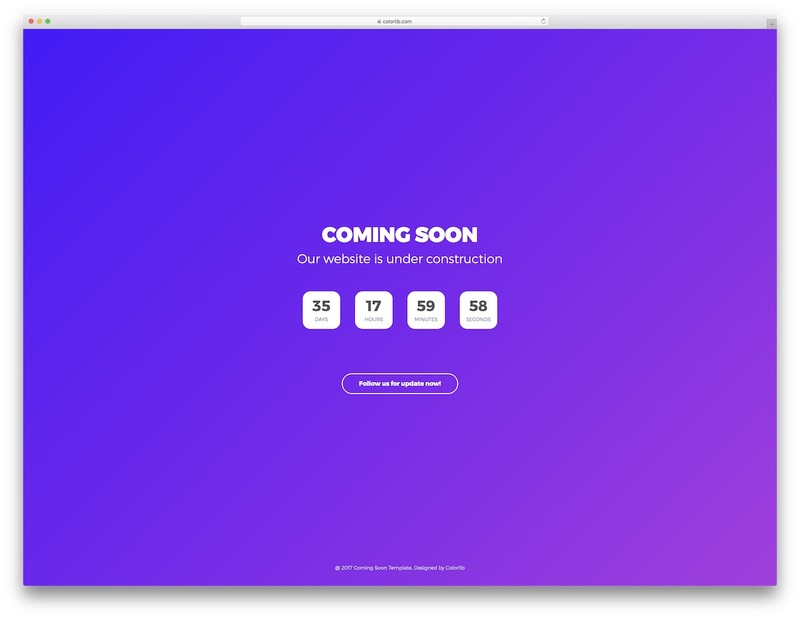 With this straightforward simple under construction template design, you get countdown timer showing days, hours, minutes and seconds. You also get a working call to action button to subscribe, which trigger a subscription window. The text fields in the popup window follows field validation, so if the user misses a detail, they will be notified. Over all this version four template is a conversion oriented under construction template. The version five template is designed like a flash sale type that you mostly see in e-commerce website templates. At the top of the page, you get a timer ticking and right below it, you get bold texts to show your message. Again this template also uses a trendy gradient as the background. This type of template best suits for app launching page, since it follows all the design trend of the modern app landing pages. You also have the option to add subscription form. The subscription form button has hover effects. The form fields support field validation, so the chances of receiving error data have been reduced. This full page modern under construction website template is also following a generic design style. But if you intended to use this template as such, without any modifications, then this would be a perfect fit for travel and tourism website templates. With a beautiful image as background and the color gradient as the overlay, this template gives a pleasant feel. The countdown timer is using a classic card flipping animation. 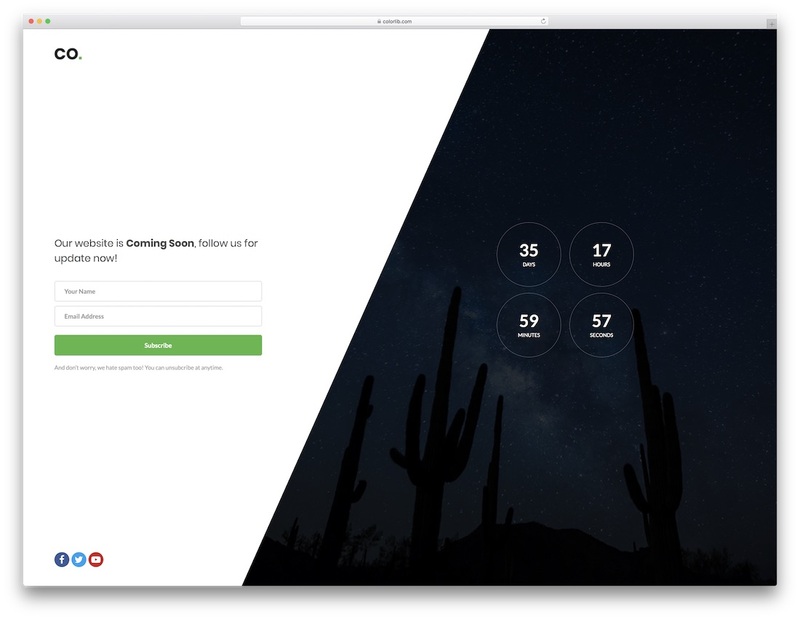 Other than the animated timer you also have an interactive subscription form. The visual effects done on the template easily manages to get people attention. At the top right corner, you have the option to add your social media icons like Facebook, Twitter, and Youtube. Our seventh version of the under construction template is purely conversion based. 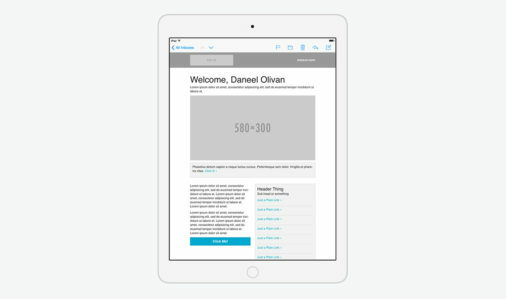 The first and the most priority we gave in this template is to get the user’s email address. Being a website owner you will know, how valuable an email is, that’s why we are using popups and slide-ins wherever possible on the site. In this template, you can clearly state the reason why the user hit the maintenance page and you can politely ask for their email. If you read some AB testing result of the subscription forms, the conversion ratio for jus email field surpassed the forms that asked for other details. As long as you make the process simple, you will get the best result. The form field supports field validation to reduce the chances of receiving faulty email addresses. Just below the form, you have a bold timer with lightweight circular dial borders. 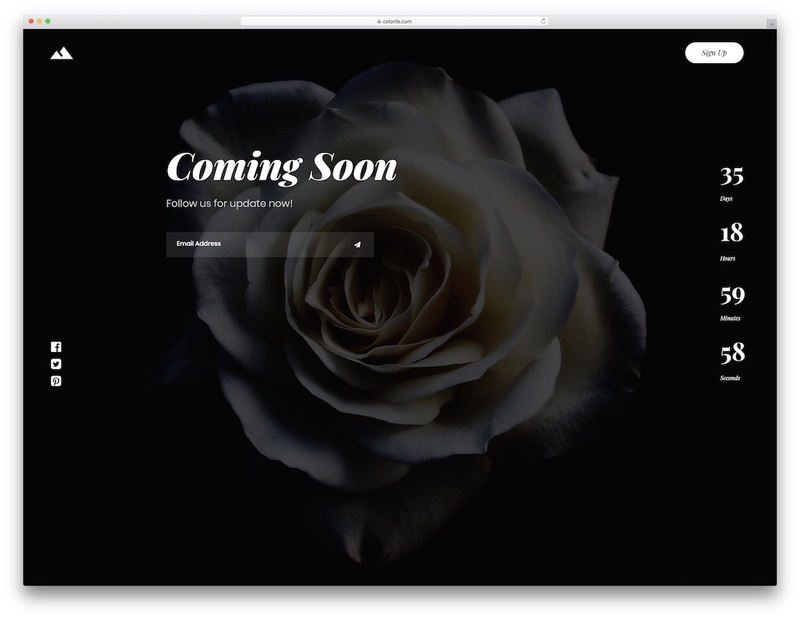 This is a classy style under construction website template. Thin line web elements and bold texts give a professional look to the template. Like most of the templates mentioned above, this template also uses image background and it is a full-width template. This template uses purple color as the color scheme, but if you need you can change this to your brand color by making a small CSS customization. 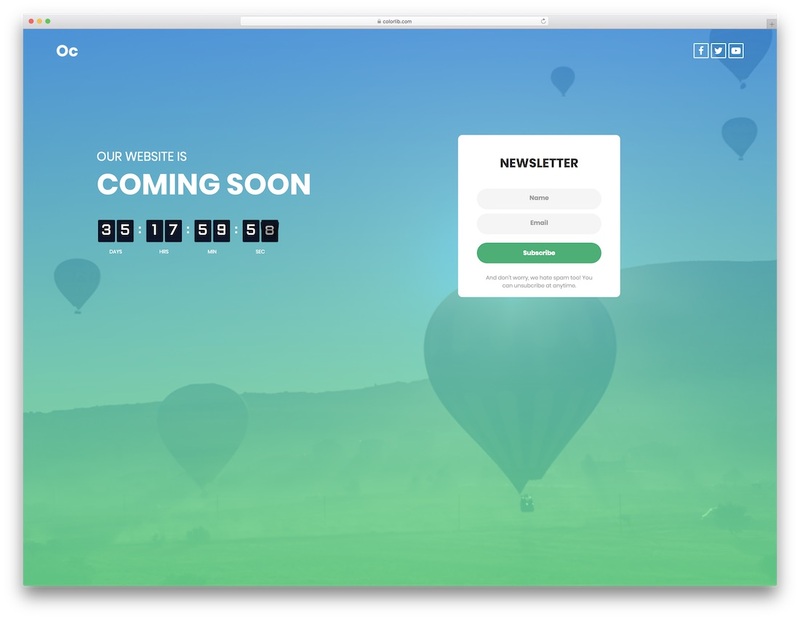 With this template, you get features like animated counter and subscription form. The hover effects and other animation effects on this template are clean and simple. The template uses latest HTML5 and CSS3 framework. This is also an image slider based under construction website template. With the bold digital clock and thin texts, this template gives a neat look. This is a straightforward template which only displays the animated timer and coming soon texts. You can use this template if your site is down for short period time, for instance like the scheduled maintenance and updates. On the right top corner, the option for signup is given. Some service based sites may allow the user to sign in and submit requests, this option may come in handy in the scenarios like that. In the footer, you have the option to add social media profile icons. The version ten of our coming soon template design follows a creative design. 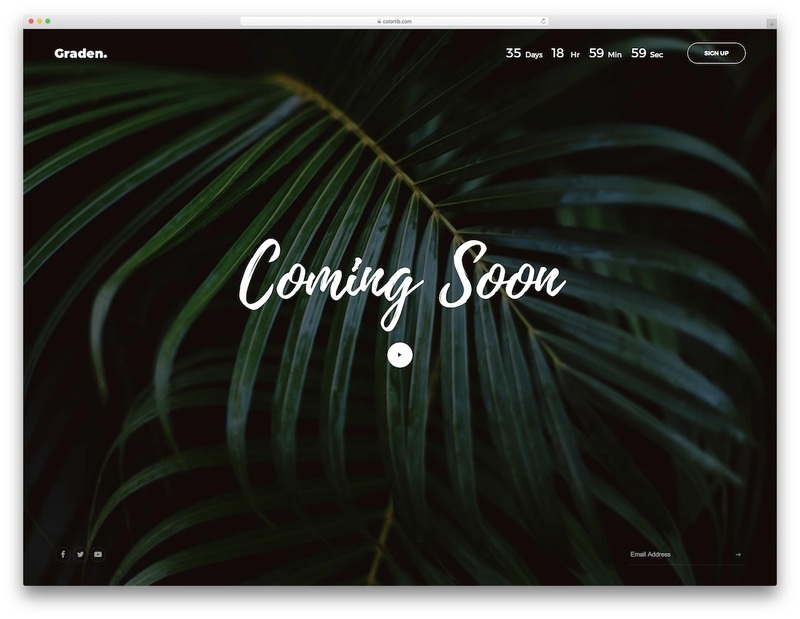 If you are using a modern creative studio style website template, this coming soon page will fit in well. In the name of creativity, we did not skip any useful features. The intuitive design of this template manages to accommodate all the web elements and texts well. To the right, you have a digital clock ticking in vertical style and to the left-hand side, you have the option to add a call to action button. 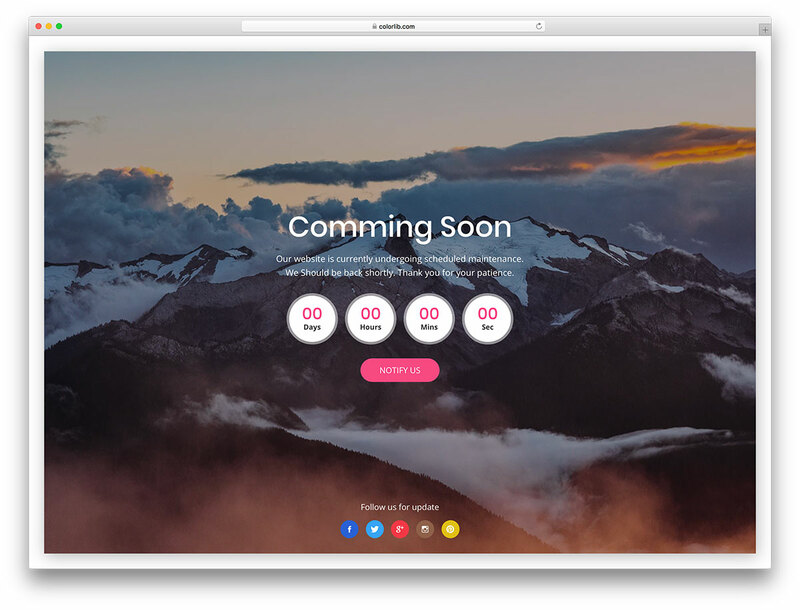 The coming soon message and the subscription form remains the centre point of the this template design. We made the hover effects and the text input animations sleek and simple. To keep your under construction page brand focused we have provided ample amount of space to make your logo stand out from the rest of the design. This is a winter theme focused under construction website template. 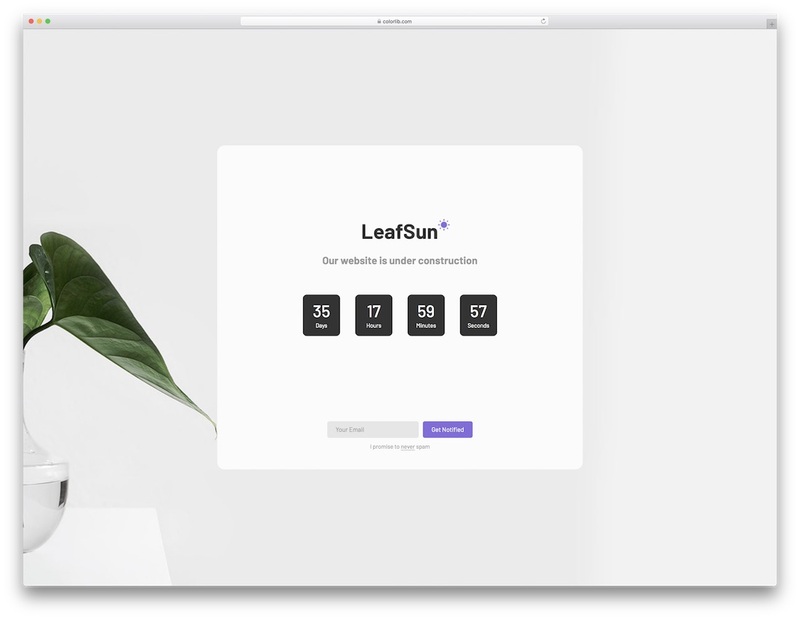 Not only the live site can reflect the eve and seasons, with this template you can also set the mood on even on your maintenance page. Since we have taken winter as the theme the background images are beautiful photographs that reflect the winter season. By changing few lines of codes you can customize the template to your wish. Other than the background image you get a modern countdown timer with a trendy font. On the top right corner you have the space to add your logo and at the footer, you have the option to add social media icons. 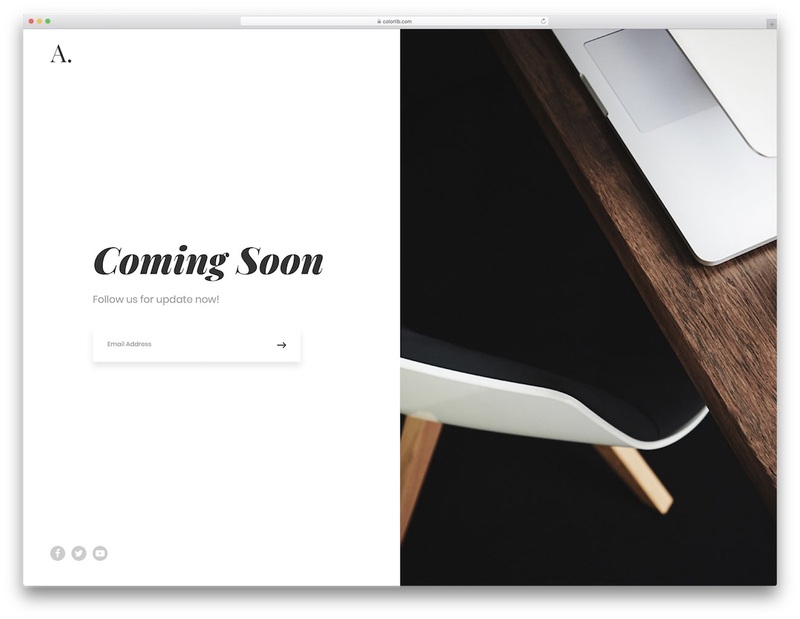 It is an another minimal looking modern under construction template from us. 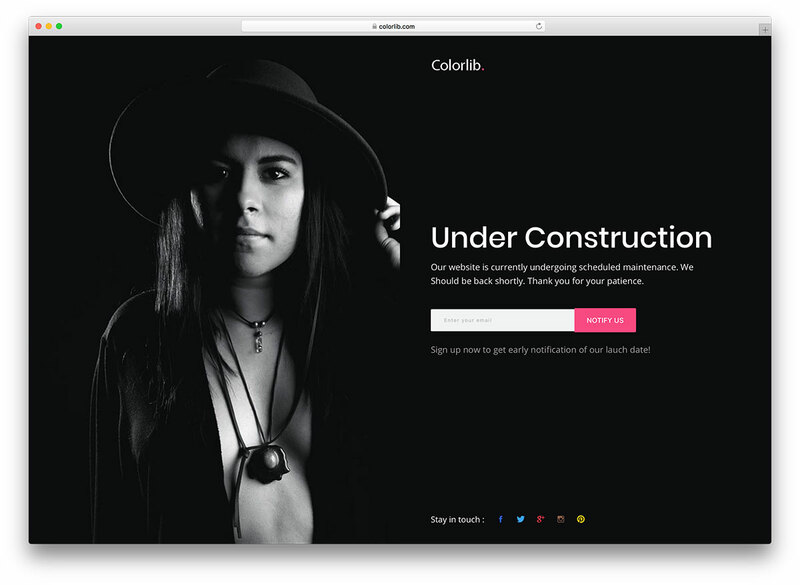 With the features of this template, you can make the under construction page reflect your brand. With the vertical split screen design, the template smartly manages the texts and the multimedia contents. On the left side, you have the option to add coming soon message, social media profile links and most importantly a subscription form. The reason for saying the subscription form in this template is because this is a website pre-launch style template. You don’t have a countdown timer with this template. With this template, you can gather leads before your site launch itself. On the right side, you have the option to add image slideshow, you can use this space to give a glimpse of your upcoming site. Again this template is made for the photography websites and studio websites. But the smart design of the template makes it an easy fit for any type of websites. This template follows a casual design scheme with trendy fonts. With the full-width design, we manage to give ample amount of space between each web elements. All the web elements like the logo, signup button, social media icons and subscription form are moved to the corners of the template. Leaving space in the center to provide a link to video contents. We have already made image slideshow as the background to keep the template interactive, but you can add video to make your band even more presentable to the visitors. This template is a tweaked version of the version twelve. It also follows a simple and minimal style design. Instead of an image slideshow, you have a big static image to your right hand side space. To highlight the subscription form we made the design of the form standout from the rest of the design. This design of the form indirectly prompts the user to submit their email address. Other than the subscription option you have an option to add social media profile link. 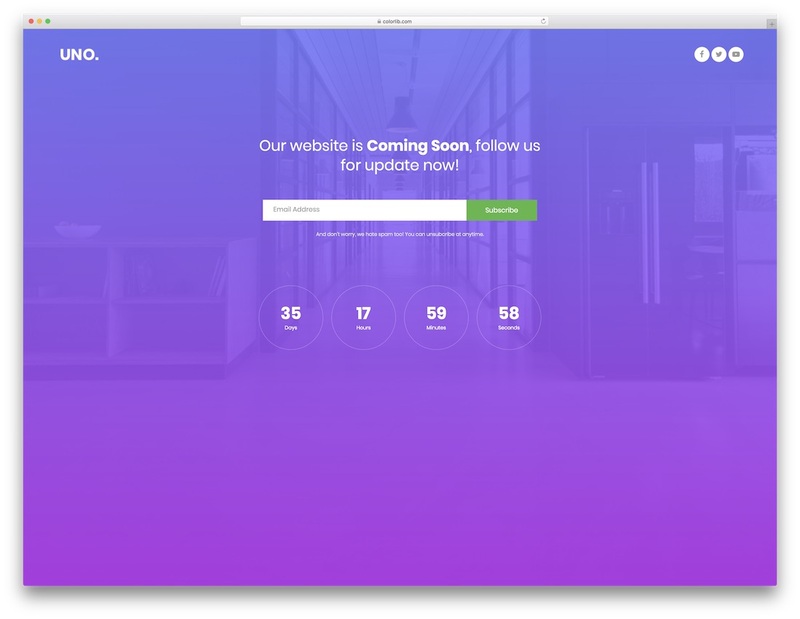 Again this under construction website template is also a pre-launch type template. It is a classic style under construction website template. With the retro fonts and card flipping style timer animation, this template has some touches of earlier web design. But with more smooth animation effects and trendy color gradient, this template becomes a refined version of the retro style. If you wish to use this template as such without making any changes, then this under construction page goes well along with the real estate website templates and construction website templates. At the footer, you have the option to add social media links. The version sixteen template is an intuitively designed under construction website template. The smart design of the template can handle more texts when compared with other templates in this list and the animation effects are also simple. 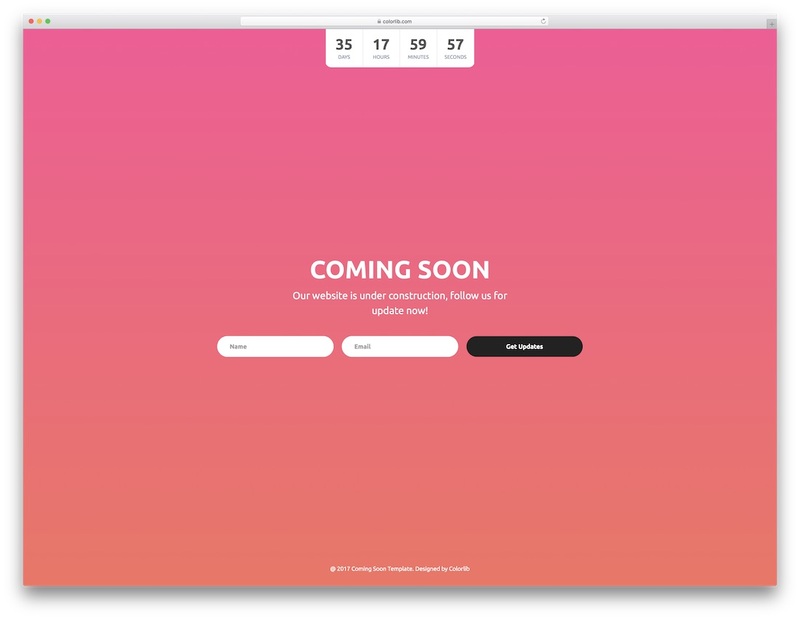 The animated countdown timer is the most elegant web element on this template. The colored rings fills based on the time remaining. On the left hand side along with the texts you also have the subscription form options and social media profile link. Subtle animation effects on the text fields also add more elegance to this beautiful website template. This template is a tweaked version of the previous under construction template. 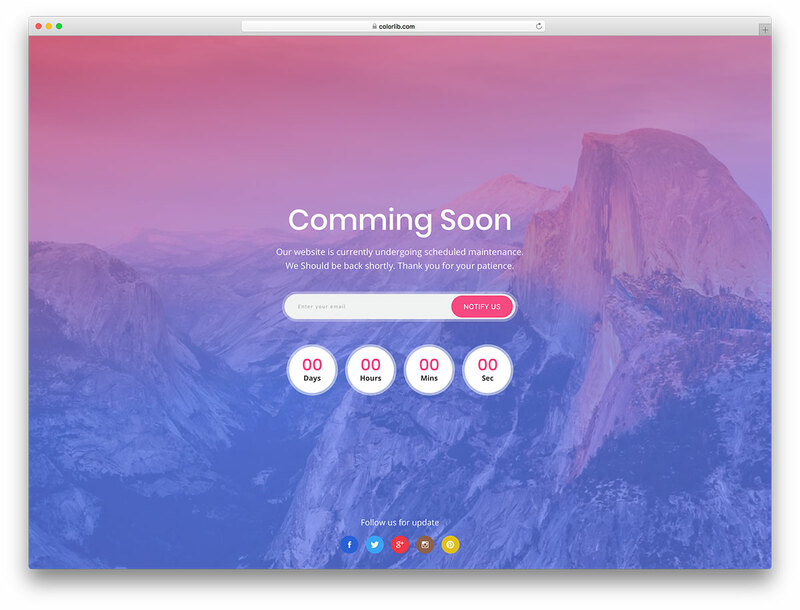 It has all the features and the options you have in the previous coming soon template. In the footer, you have the options to give a link to social media links like Facebook, Twitter, Google Plus, Instagram, and Pinterest. So you have all the major social media covered by this template. The animation effects and hover effects are also neat and simple to give a professional look. This is a pre-launch under construction website template or a short maintenance notice template for sites. It is a simple and straightforward template, you can directly mention the reason for showing this simple and elegant under construction template. You don’t have any other flashy elements with this template. What you get with this under construction page is a call to action button, a text message with neat looking font and at the footer, you have the option to add your social media profile link. This template uses HTML5 and CSS3 framework. The nineteenth edition of our under construction template is a dark skinned template. If you are a person who always asks does this come in black, then this template is for you. In fact, the only dark-skinned template in this list. Though minimal templates with lots of white space are the trend, many still love to follow a dark skinned template. With this under construction page, you have enough space to add your custom message. If you are planning to own a personal branding website, then this template gives you space to add your image to the pre-launch page itself. So the user will be sure that they are subscribing to the site of the person they are following. With the thick border, this template looks like boxed width template. The hover effects and the other visual effects on this template make it a fit for the present-day website designs. Like all other templates, this template also has a big image as the background. The timer uses circular clock holder to display the days, hours, minutes and seconds. With this template you get features like animated timer, call to action button to subscribe and social media profile link. 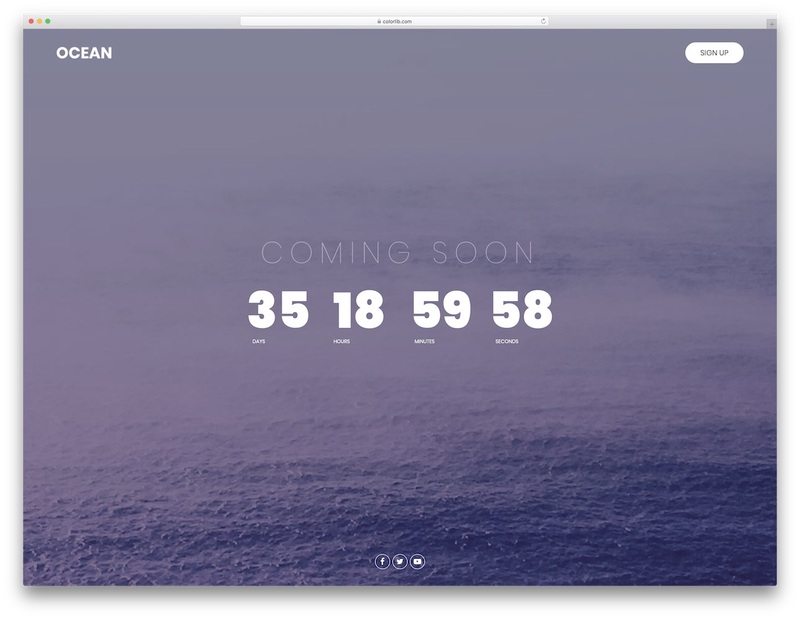 It is a clean looking modern under construction website template. This template uses a flat style design layout, which gives a professional look to the template. Like most of the templates mentioned above, this template also uses image background and it is a full-width template. 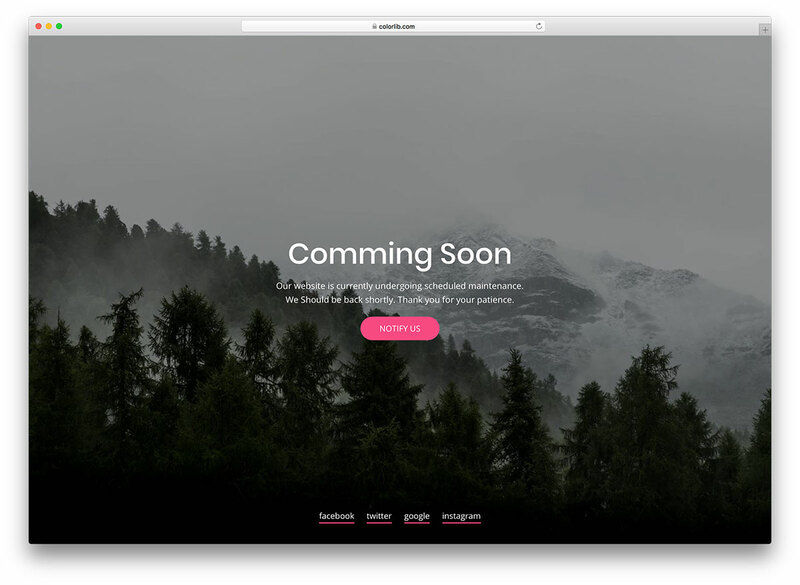 This template uses pink color as the color scheme, but if you need you can change this to your brand color by making small CSS customization. 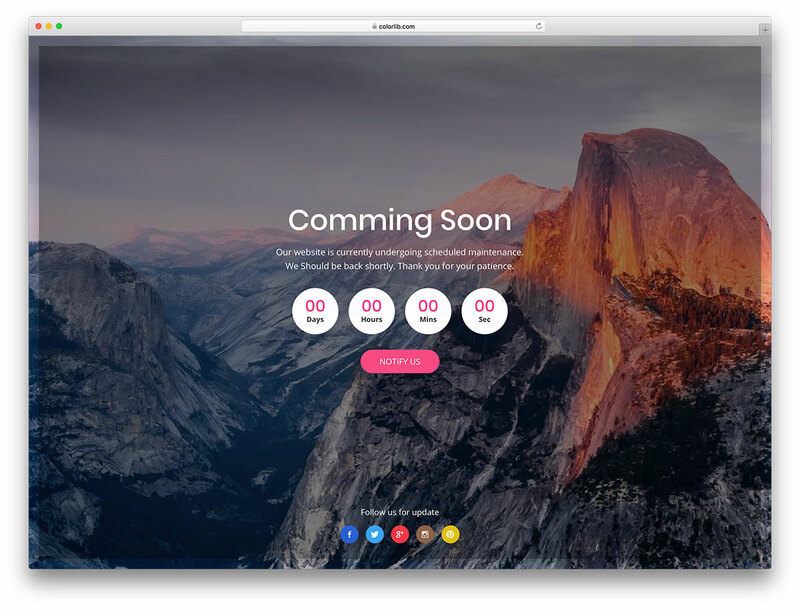 With this template, you get features like an animated counter, subscription form, and social media profile link. The hover effects and other animation effects on this template are clean and simple. If you are site is shut down for a temporary maintenance, you can use this template directly without making any changes. The template looks clean and simple with professional fonts and subtle animation effects. 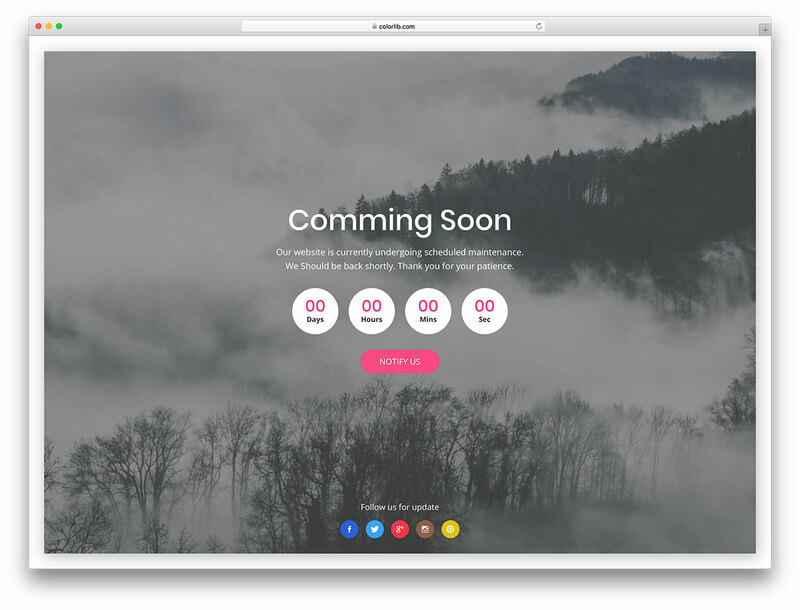 With this template, you get features like animated timer, submission form, and social media profile link options. The hover effects on the social media icons are done neatly. The template uses HTML5, and CSS3 frameworks. Out of the box, this template is mobile responsive, cross-browser compatible and the clean-coding makes the adding of this template to your existing site easier. This under construction template is similar to the version twenty. With the boxed design, the web elements are made to fit well along with the design of the template. The texts and the web elements are designed well so that they are visible even on the image background. 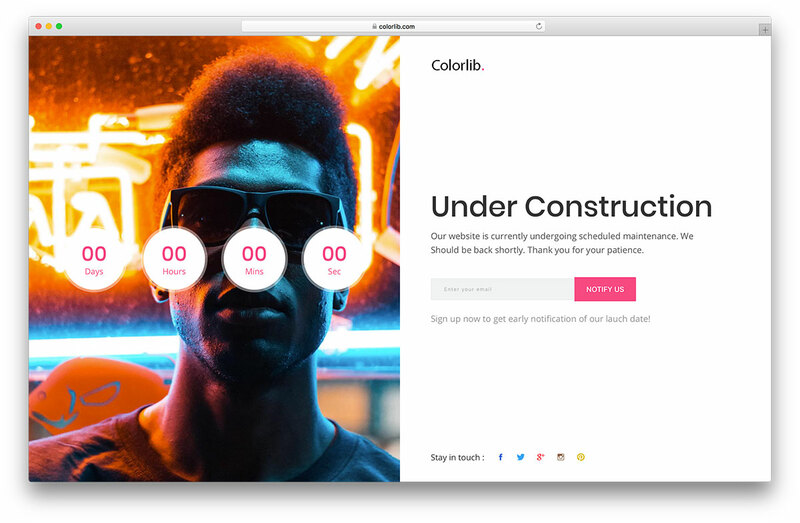 This under construction page gives you options like animated countdown timer, call to action button, ample amount of space to add texts and social media icons. How You Gonna Engage Your Visitors? 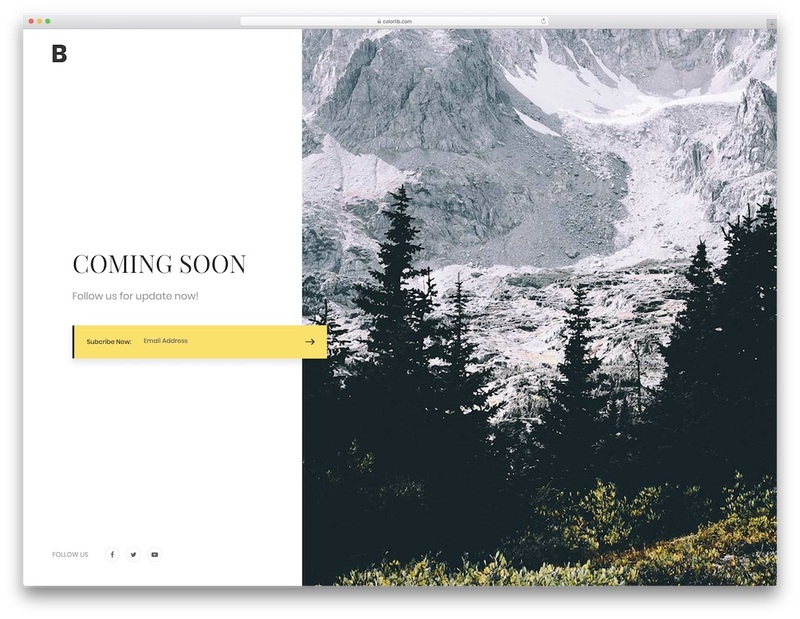 These are some of the best free under construction template you can use for your site. 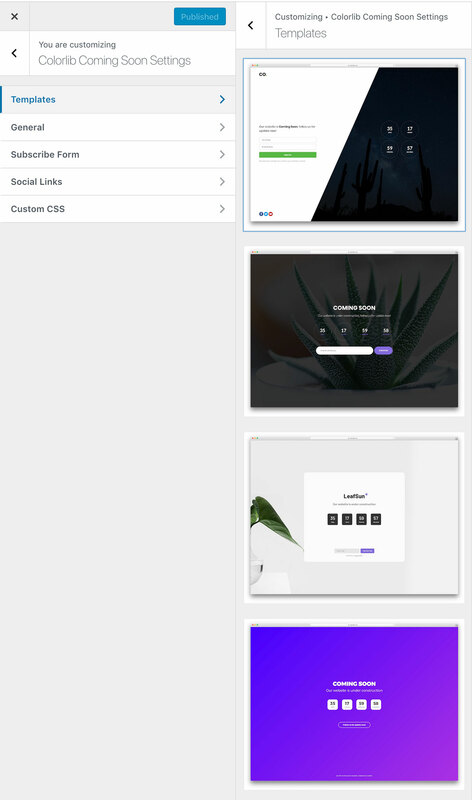 All the templates mentioned in this list are flexible so that you can use these templates for maintenance mode page or for website launching page. Most of the template follows latest coding framework and also meets the industry standards, so you needn’t worry about the performance or installation of these templates. To find a better website template with good code quality standard, please check out our website template collections. I’m looking for assistance in how I need to modify the submission form to personalise it to my specific needs. Any help would be greatly appreciated. Unfortunately, we don’t do custom development. We are good at making templates and themes. where can i find the emails entered in the subscription form? By default these templates won’t store anything. You need to either add your own backend of integrate it with Mailchimp or other email handling service. That’s up to you. Please can you tell me how to avoid the countdown to “restart” all time i refresh the page? When I try to install these themes, I get a failed message stating that they’re missing css.stylesheet. Can you tell me what it is I’m missing? You are getting this error because these are not WordPress themes but HTML templates. You should tell people upfront that this is only free under an attribution license. There is still a fee involved to remove the credit link. It is important (and dutiful) that you inform people of this upfront. How do I use this for my wordpress blog? For now it is not possible but we are thinking about introducing a plugin for that. I’m a newbie in coding webside’s so i need a little help! 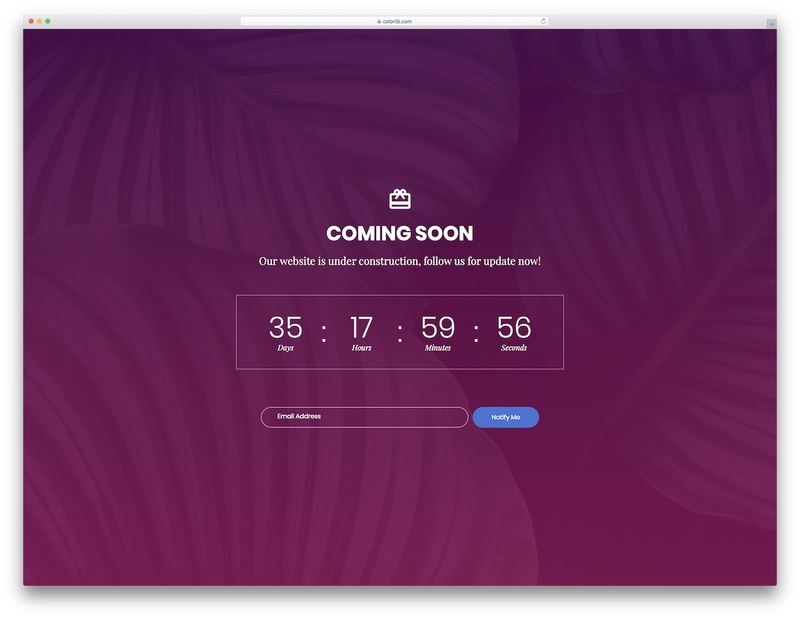 I love yours “Coming Soon Template by Colorlib V01” template, but can somone help me, in wich js file i’v to change/insert the email address when clicking the subscribe button? Thx for the great coming soon template! Thanks, but Colorlib V19 is missing something or a lot, it’s not suitable to upload, missing stylesheet etc.. Nothing is missing for V19 nor any other one. However, these aren’t WordPress themes but an HTML templates. Coming Soon plugin for WordPress will be released very soon so stay tuned. Thanks for the list, very nice variety of themes. How can i make the subscribe button on coming soon 6 template work with PHP to send email notification? is there any file to download? it is not included with the template, where i can find it? thanks. You Rock Aigars. Superb template, it’s looks awesome on my site. Thank You for sharing. This plugin is fantastic for hiding my sites while I work on them! However, there are people (such as vendors) that I need to show the site to. Is there a backdoor I could make, such as “mysite.com/preview” or another page/place I could direct them? Also, at what level can someone whose logged in see the pages under development? A “subscriber”, “editor”, just “admin”? Depends on the settings you use for the plugin. By default only admin will be able to see the site when logged in but you can change that.